Sell sheet in Adobe pdf format. Rebecca Kennel has uncovered the little gems of paradise that encourage you to stop and smell the roses. Whether you are a tourist or a local resident, discover the best places to sit and reflect in beautiful Victoria. I want this book for my own explorations and to give to every guest that comes to visit Victoria. In Victoria—Bench by Bench, Rebecca introduced me to wonderful areas that I had not visited in my 16 years in the city. Thank you Rebecca for this guide to lesser known beauty spots in Victoria and for sharing your own journey of exploration. 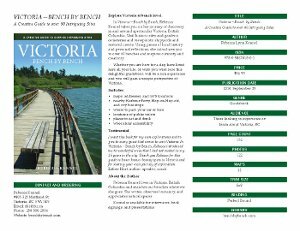 Rebecca Kennel’s new book, Victoria—Bench by Bench, A creative guide to over 60 intriguing sites, (Rebecca Kennel Publishing, September 2010) is a guidebook, a personal journal, and a historical record of places in and around spectacular Victoria, British Columbia. Kennel was born in Montana, raised in Saskatchewan, and moved to Victoria, British Columbia in 2004. Her love of writing, exploring, and learning led her to discover inspiring places to sit and write. As she dug deeper into the history of the locations, she discovered interesting details that she shared with her friends: “Did you know that. . .” Kennel soon discovered some people who had lived in Victoria all of their lives weren’t aware of some of the places she found or the history. She has written Victoria—Bench by Bench to share what she has learned and her own experience. When not searching out great places to write, Rebecca Kennel finds other excuses to be outdoors. She loves biking, wandering, and talking to strangers. I wrote this book to share my experience of these great places I have found and to encourage others to go out exploring. Victoria has a rich history and so many beautiful areas, but we tend to get busy with our lives and don’t take time to stop and search out places that are unfamiliar to us and learn about them. I took a workshop on self publishing as I had several book ideas and I wanted to see what I could put together. My “benches” book was the one that was easiest to outline and looked like it was worth putting time into, so I worked on it full time. I explored more benches to add to those I had already documented, took photos, designed the layout, and arranged for printing and publishing. Why did you publish the book yourself? Self publishing is becoming easier with the tools a person has access to now compared to even five years ago. I love to challenge myself and continue learning, plus I have a wide range of skills that I could draw on and a great network of friends to advise me. It somehow seemed easier than searching out a publisher and gave me more control over the whole process. Anyone who wants to learn about Victoria: visitors, residents, newcomers, and armchair travelers. It is not only a guidebook with information on buses to take, where to park, and nearby amenities, but is also a mini-history book along with creative writing that captures my experience of the place. Which is your favourite bench? Whichever one I am sitting on at the moment! The bench I chose to go to depends on the weather, the time of year, and whether I want to write, sketch, chat with a friend, or observe people. What would you suggest to a visitor who has one day to explore Victoria? That would depend on their mode of transportation, the time of year, and their own goals. If someone is on foot, I would suggest the benches downtown, the Westsong Walkway, or the Harbour Pathway. If they cycle, the Seaside Touring route has great benches along it with a few sidetrips to higher elevations or the Gorge Waterway has benches that are easy to cycle to. I specifically put in the Hop-on Hop-off stops for tourists who want to get off the bus and experience a place, rather than just look at it as they drive by. And if they are driving, they can easily get to some of the gardens and parks in the Central area or in Esquimalt. I have some ideas, but I haven’t had much time to think about it. Since I like to travel to warm climates, I thought I should do something like Singapore—Bench by Bench! But there is more here on the peninsula that I would like to document, although it might take the form of Farm by Farm rather than Bench by Bench.